Corrugated box industry is developing rapidly nowadays. With the market growing mature and the technology upgrading, corrugated paper manufacturers want to survive in the market and keep developing, they need to further improve the efficiency of equipment and their product quality and quantity. In the production of traditional corrugated board production lines, due to mechanical baffle deviation rectification, cases like paper surface breaking and paper breaking happen frequently, which causes the waste of materials and time. Moreover, when material width is being changed in the production, misplaced gluing of the material will cause dry pulp lines leaving on the hot plate and operators need to clean them up before continue producing, which reduces the efficiency of corrugated board production line. Techmach bridge web guiding system with wide array infrared sensor can flexibly choose centered or edge-aligned web guiding mode. In addition, it can keep detecting, when the width of paper changes, without manual operation. It is suitable to be used in the production of 3, 5, 7 layers corrugated boards. Moreover, it can measure the width of each layer of the cardboard and display by layer or output the width signal. The casing of Techmach wide array infrared sensor is hermetically sealed, which can effectively prevent air, dusts and water, so that it can correctly detect and be conveniently used in poor production environment.Without stable tension, it is unable to produce stable quality corrugated paper. 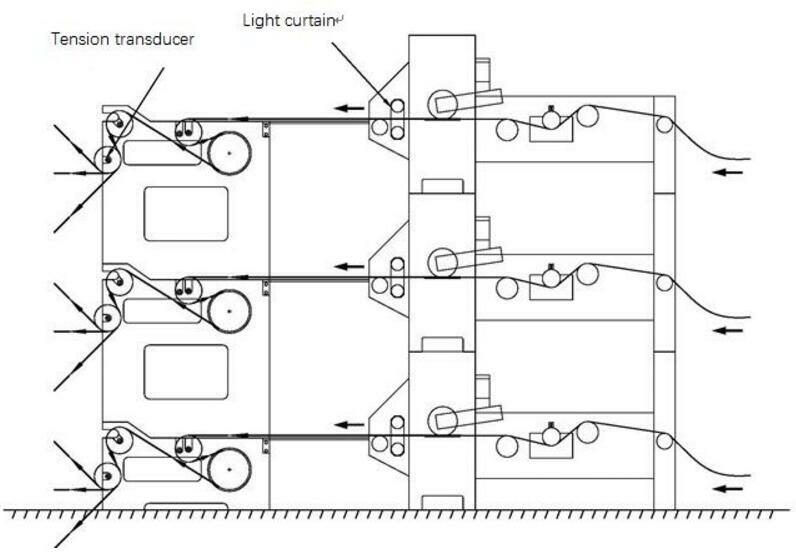 Techmach tension transducer can be placed in the bridge exit to test the paper tension, continuously compare the real time measured values with the preset values and output control signal from tension controller according to the result, actuate pneumatic brake, change the torque of anti-curl axle, and then acquire the stable tension which is required for the paper surface. Splitting indentation machinean is an important part of corrugated board production line, which can greatly reduce the waste of cardboard. Techmach aplitting machine web guiding system adopts high precision, wide CCD sensro, along with big thrust electrical actuator, accurately centered or edge-aligned guiding the paper along its edge or printing line, making sure the aplitting correctly and stably and reducing the quantity of waste selvage of corrugated paper. To reduce the downtime for plate wiping happening in the later stage printing process, corrugated cardboard production line manufacturers need to configure effective dust removal device to remove the dust on the surface of corrugated cardboard. To meet the needs of industry development, Techmach introduce top corrugated paper dust removal system. The system adopts patented three-cavity structure that can generate strong airflow and effectively remove the dusts from the paper surface, hugely shortening the downtime for downstream print providers.